Technology is changing the way organizations go about even the most basic, everyday tasks. Not long ago we featured the Equil Smartmarker, a device which retrofits whiteboards with the capability to stream, share and save notes as digital files. A new design concept, called the Listening Table, now promises to make meetings even more streamlined. 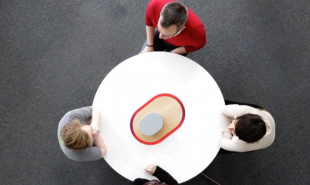 The table, designed by New York Times Research and Development Labs, captures the conversation of those sat around it. It is fitted with a central array of microphones connected to thermal cameras, which are able not only able to accurately pick up everything that is said, but also to identify who said what. While the capacity for accurate voice recording is certainly useful, as an innovation it does little to advance on the trusty old Dictaphone. What truly sets the Listening Table apart is its ability to discern important moments in a conversation, and to remove filler. The table incorporates capacitive strips which, when touched, drop a marker in the recorded conversation. When the recording is reviewed, participants can see a high-level summary of the meeting, outlining the topics covered, the markers dropped and the available recordings. The designers created the table with a straightforward aesthetic that clearly communicates its function. The clean simplicity of the design, the prominence of its recording equipment and a basic on/off flick switch are all conscious features, intended to distance the Listening Table from more surreptitious recording devices, which are an increasing concern in this era of state snooping and eavesdropping TVs. At present the design is only conceptual, and is unlikely to be hitting meeting rooms soon, but the idea of sensors that can measure context as well as content is incredibly exciting, and will become more so as the Internet of Things delivers ever-more connected devices into our homes.